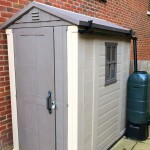 My 10ft wide shed was becoming damp as it had no gutters, so I went to my local DIY supplier and priced up all I would need and then realised it would not go in the car. On returning home I went onto the internet to see if there was a simpler solution. Hey presto – Halls Rainsaver ltd, kit ordered on the Saturday, it all arrived on Tuesday morning, fitted in less that an hour and works a treat. Brilliant. 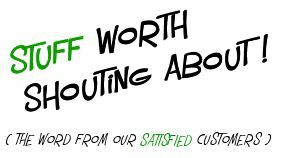 The product is as good as I thought it would be and their customer service is first class. They replaced a part without charge which I broke due to my stupidity. This is very unusual most companies would have expected me to pay. Highly recommended. As a 71 year old female I found this product a doddle to fit. It took about 15 minutes each side of my 6ft shed to fit. It also looks good. I have already recommended it to female friend of a similar age to me who will most probably be ordering from you! Very easy to install, I installed the 8ft length single handedly. Works a treat! 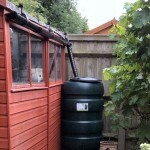 Keith at Hall’s Rainsaver Ltd was very helpful and patient. Very pleased with this. Easier than easy to put up. I found it incredibly easy to fit, only double checking with the instructions that I was doing it in the right order. It almost flew itself onto the shed. The only negative thing I would say is that it is perhaps a bit pricey – but given the quality and ease of it, it is well worth the money. The guttering was very straightforward to put up. I was very impressed with how quickly you sent me a replacement end stop, as the original had snapped on attachment. Many thanks. Cannot recommend too highly. Helpful & courteous to someone not sure she could tackle the job and when the product arrived less than 24 hours after ordering, I found it fitted like a dream. If all jobs were as easy as this! Thank you. Wow ordered on the 18th, delivered by post on the 19th, cant better that. System wonderful, have just put this system on a wooden cabin in my garden, so simple but so effective, many thanks.